This RTD probe with pt100 ohm RTD has a heavy duty 3-prong Omega "OTP" style connnector for easy installation to extension cables, hand held meters or other instrumentation. The sheath can simply be placed into a container, or installed into place using an optional "BRLK" or "SSLK" compression fitting. The precision 100 ohm Class B DIN platinum thin film element contained in this sensor wll provide years of accuate and dependable service. Standard: Specify: 1/8, 3/16 or 1/4 for probe diameter in inches. 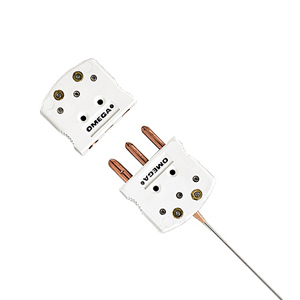 3-wire lead configuration standard, others available. Add $1 per inch for lengths above 24". Metric: Specify M30 for 3 mm, M45 for 4.5mm or M60 for 6 mm, for probe diameter in mm. Add $1 per 25 mm for lengths 600mm. RTD Probes cannot be bent in the field. OMEGA offers custom bending; consult our Sales Department.